The government’s higher population committee has made a series of recommendations, including linking residence permits to education and clamping down on domestic helpers, with the aim to reduce the number of expatriates in the country. The committee recommended that a residence permit must be linked to the applicant’s level and type of education which means that the profession of an expatriate must match his or her type of university education. It called for imposing restrictions on dependent visas for wives and children and also on visit visas for relatives. It also called for applying certain regulations and caps on the number of domestic helpers and imposing certain fees on additional maids, raising the fees gradually with the number of maids employed. 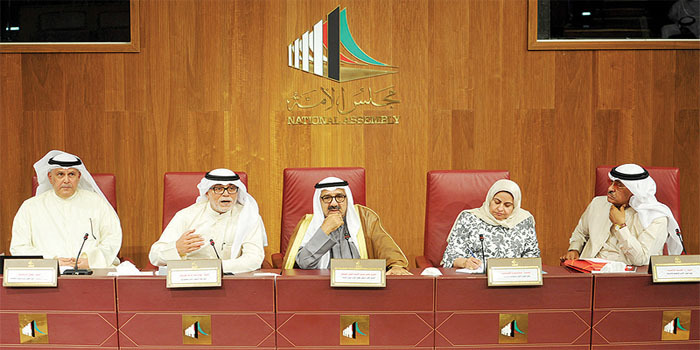 The committee, which consists of representatives from almost all ministries and government departments concerned with employment and the demographic policy, called for resolving the problem of “absconding” workers by giving them a grace period for up to three months, increasing fines and issuing stringent laws to penalize those who employ absconding expats. It called for activating fingerprint devices at border points to prevent barred people from entering the country by changing their passports. Other recommendations called for automating the labor recruitment process to prevent cheating and apply strict measures against employing employees in jobs they were not recruited for. The committee called for forcing contractors working on government contracts to send back all their workers after completing the project. Meanwhile, lawmakers criticized the government yesterday for not providing significant information about the mega projects in the Silk City, the northern economic zone and the five islands, which the government said will require some $600 billion in investments. Defense Minister Sheikh Nasser Sabah Al-Ahmad Al-Sabah headed a large government team to provide economic and financial explanations to the Assembly’s financial and economic affairs committee, but lawmakers came out of the meeting disappointed. Sheikh Nasser said the meeting also discussed the development plan, adding that the government will finalize the draft law for the Silk City mega project within the coming few weeks and send it to the Assembly. He said the meeting discussed progress made in the northern economic zone and that discussions are still ongoing on this issue, adding that the draft law to regulate the area does not violate the constitution. Head of the panel MP Salah Khorshid said the meeting also discussed Kuwait’s 2035 vision and a number of projects to diversify sources of income, provided they do not violate the constitution. MP Al-Humaidi Al-Subaei said the government did not provide any cohesive project based on a well-defined strategy, but mostly verbal information. MP Riyadh Al-Adasani said that if the draft laws for the mega projects include violations of the constitution, he will grill the defense minister. MP Safa Al-Hashem said the government did not provide any concrete proposals or any legislation on the issue. In the meantime, two independent candidates elected in the by-election held on Saturday to fill the seats of former MPs Waleed Al-Tabtabaei and Jamaan Al-Harbash will take the oath in tomorrow’s session and serve the remaining one and a half years in this term. Bader Al-Mulla and Abdullah Al-Kandari, both lawyers, were elected in the second and third constituencies, respectively defeating their nearest Islamist rivals – former MPs Hamad Al-Matar and Ammar Al-Ajmi.